Austria is the key Alpine ski nation, with many hidden treasures waiting to be explored. The Arlberg ski region, including St. Anton, St. Christoph, Lech and Zürs the jewel in its crown and not only the birthplace of modern Alpine skiing but also a most popular playground for Europe's Royal families. Kitzbühel is located in the Tirol, justifiably world famous for the annual Hahnenkamm ski race, cosmopolitan atmosphere and a distinctive medieval town flair in addition to the 179km of linked skiing on its doorstep. Two annual Alpine celebrations worth mentioning in Mayrhofen, the first is the renowned Altitude Comedy Festival, which sees ‘the big guns of comedy’ provide a week of unforgettable laughs, and the second is Snowbombing! which mixes fresh current talent with crucial pioneers of the music scene. On the subject of music vibrating off of the snowy slopes of the Austrian Alps, we cannot forget Ischgl & Galtür, with 304 kilometers of pistes and stylish hotels; it’s one of the most popular winter hot spots in the world and attracts international superstars to its open-air concerts. Surrounded by glorious mountain peaks and glaciers Obergurgl & Hochgurgl are guaranteed good snow conditions from November to May and new for W18/19 is totally uniqueSölden with a great selection of bars, restaurants and high-altitude skiing at its best. The Saalbach-Hinterglemm-Leogang Ski Circus was extended by the new 'Tirol-S' high-speed gondola to neighbouring Fieberbrunn – known for its consistently great snow record, Lech and Zürs are linked with St Anton and St Christoph to provide even bigger ski domains, good snow, pulsating nightlife and accommodation that’s usually not far from luxurious. And for those who really want challenging skiing, St. Anton, Saalbach, Hinterglemm and Kitzbühel have slopes that most skiers and snowboarders will find more than steep enough. Skiing in Austria has always attracted British skiers and snowboarders, and many of them learned to ski in resorts such as Alpbach, Niederau, Söll, Mayrhofen, Obergurgl, and Filzmoos. Family skiing in Austria is a major attraction, and in many cases parents have returned later with their own children, confident that the experience they had when they were learning is as rewarding as ever. The key to ski holidays in Austria is the country’s celebrated ‘Gemütlichkeit’ culture, which attempts to make guests feel welcome, entertained and well fed, both on the slopes and after the lifts have closed. The service excellence and hospitality that you encounter all over the country is guaranteed to leave you with a warm glow even in the cold winter weather. You’ll find the typical Austrian welcome both on the slopes with genuinely friendly instructors and lively après-ski in almost every Austrian bar when the lifts have closed. Or even before they have - the partying starts early, and it’s a familiar sight at many of the resort’s mountain huts to see skiers dancing while still in their ski boots. On the slopes, Austrian resorts enjoy a good snow record. There is plenty of high skiing, the highest ski resorts in Austria such as Kühtai, Obergurgl, Obertauern, Galtür, and new for W18/19 Sölden are as snowsure as you’ll find anywhere. Austria’s skiing regions offer no end of a variety of ski runs, activities, and stunning scenery. From stylish design hotels to traditional wooden chalets type hotels we have the best accommodation options. More than any other Alpine country, ski accommodation in Austria is almost always several cuts above average. So Austria really does tick all the relevant boxes. The World famous Arlberg ski area is the largest interlinked ski area in Austria! Four cable cars are constructed to bridge the gap between St. Anton, St Christoph side and the Lech, Zurs side completely eradicating the need to take a ski bus between the two ski areas. This new ski-link has created complete ski convenience as most of the properties in our Arlberg ski programme offer skiing from the front door. With Kitzbühel at its heart, the Kitzbüheler Alpen is a ski region made up of many big names in the Alpine ski world including Kirchberg, Kitzbühel, St. Johann (Schneewinkel), Söll, Ellmau, Westendorf and Scheffau. The skiing is on a massive scale and one ski pass covers numerous different regions (AllStarCard / Super Ski Card lift pass bookable locally). Ski buses and trains connect outlying ski areas in the Kitzbüheler Alpen, whilst the Ski Welt area is all linked with lifts and offers huge ski distances to cover. The ski-link which the locals have dreamed of for decades has become a reality, a few years ago, the Saalbach-Hinterglemm-Leogang Ski Circus has been extended by the ‘Tirol-S’ high-speed gondola to neighbouring Fieberbrunn - known for its consistently great snow record. The vast SkiWelt Wilder Kaiser-Brixental Area is an intermediate skier's dream, connecting 9 villages in total, and enjoys an enviable snow record, backed by an extensive, high-tech system of snow cannons for added security and confidence. The beautiful Alpbach and Wildschönau/Ski Juwel ski areas combined give a total of 109km of pistes. Mighty St Anton is one of the best high-alpine ski resorts in the world, and has the reputation of being best suited to strong skiers and boarders. But that certainly shouldn’t put less aggressive skiers off – there’s plenty for them too. It may be tiny, but the “small but perfectly formed” picture-postcard village of St Christoph, cocooned in a spectacular open snow-bowl, shares its slopes with Austria’s No. 1 world-class ski area. Ski Zürs and join the famous ‘White ring’ ski circuit from Lech. Your Arlberg lift pass also covers the resorts of St. Anton, St. Christoph and Stüben. 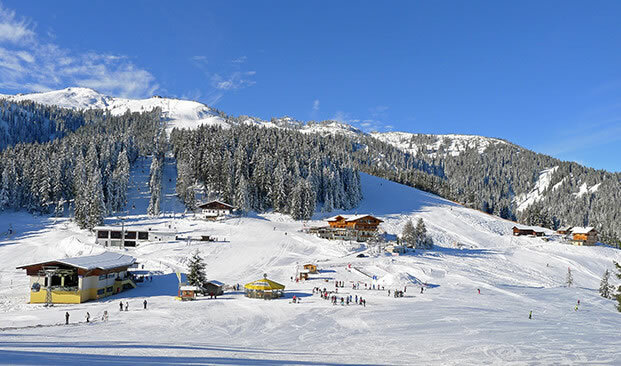 Situated in the Austrian Alps close to the Italian and Slovenian border, lies the picturesque ski & spa resort Bad Kleinkirchheim, where 25 ski lifts, 23 ski huts, 103km of perfectly groomed pistes plus extensive snow-making facilities guarantee unlimited skiing pleasure. Filzmoos is a truly idyllic mountain village where little has changed over the years. It has an excellent snow record, superb panoramic views and downhill runs straight into the village. The charming little community of Galtür (1585m) - dubbed an “Alpine idyll“ by the writer Ernest Hemingway in 1926 – is the highest ski village in the Austrian Silvretta region. Obergurgl (1,930m) and its smaller, higher Neighbour of Hochgurgl (2,150m), are situated in the upper Ötztal Valley on the main Alpine ridge where snow is always guaranteed from November through to May. About 90 minutes drive south-west of Innsbruck with slopes rising up to 3,080m. Winter is a great time to visit Igls. Set on a sunny mountain plateau with stunning scenery of nature all around along with fresh Alpine air and remote trails for hiking and snowshoeing, this is a real winter wonderland. The choice is yours – ski hard or party hard. But if you can manage both, you’re in for a hectic, thrilling week! Ischgl is a pretty but also pulsating village just 90 minutes from Innsbruck with a fantastic snow-sure ski area. The celebrated and iconic resort of Kitzbühel is home to arguably the most challenging World Cup race in the world – the infamous Streif. You can try sections of this incredible run or seek other challenges across this excellent ski resort for passionate skiers. Situated at the heart of the Schneewinkel ski area, and at the base of the Kitzbüheler Horn, St Johann is an ideal resort for intermediate skiers. The relaxed ski area is perfect for a chilled ski holiday with wonderful mountain restaurants and plenty of cafés in the charming village centre. Surrounded by glorious mountain peaks and glaciers, Obergurgl nestles at the end of the Ötz Valley and are guaranteed good snow conditions from November to May. Well known for its top quality hotels and modern, queue-free lift system, it has always been one of Inghams’ most popular resorts. The Romans who toiled over this high, wintry mountain pass could scarcely have imagined that one day people would actually come here for pleasure! Obertauern has one of the longest seasons in the Alps: winter lasts until early May. A favourite Inghams resort for many years, with many repeat visitors, Seefeld enjoys a scenic position above the Inn Valley, close to Innsbruck. Ski Ellmau! The attractive village of Ellmau is situated between the rugged Wilder Kaiser (Wild Emperor) mountains and the more gentle Kitzbüheler Alps. In fact Westendorf, quiet and attractive retreat that it is, actually enjoys access to two vast ski areas – SkiWelt and Kitzbühel. Sölden is totally unique as a ski area, with three mountains over 3,000 metres and two glaciers - Retttenbach and Tiefenbach, ensuring superb snow conditions and reliability. Skiing is almost exclusively above the tree line with 144 km of world–class skiing for all ability levels, easily accessible by the efficient lift system. Few ski areas have such an idyllic setting as Zell am See, the pretty lakeside town which becomes the focal point of the Zell am See-Kaprun Ski Area - an exciting and lively ski resort in winter. Fly from: London Gatwick, Heathrow, Luton, Bristol, Birmingham, Manchester, Edinburgh, East Midlands, Stansted, Leeds-Bradford & Liverpool.